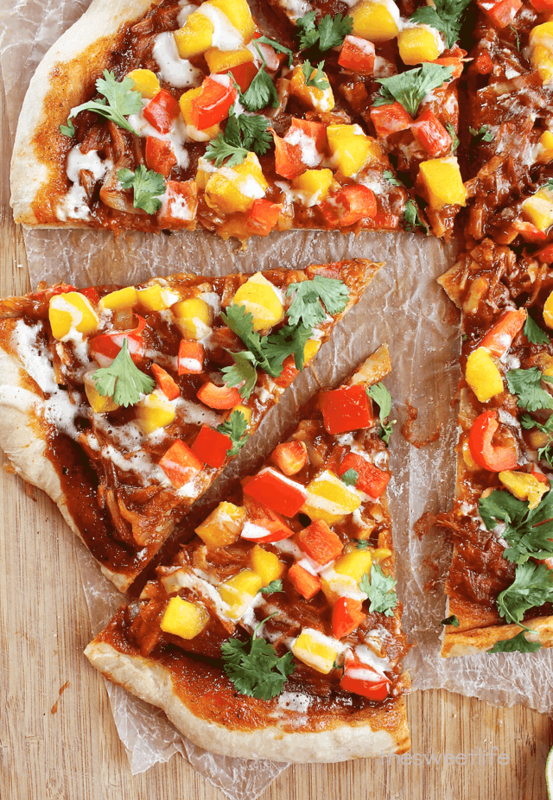 This Vegan Pulled Pork Pizza is made with shredded heart of palm, homemade bbq sauce, mango salsa, and cilantro cashew creme for an unforgettable meal. When I went vegan 8 years ago it was for one reason: I had become aware of the torture and suffering that animals endure at our hands and I did not want, in any way, to be part of that. Since then I have found so many more reasons to be vegan which you can read all about here. But remove all the benefits of health and the significant impact on the environment and I would still choose vegan. My choice to live a vegan lifestyle is about liberation, primarily animal liberation. It is a movement that demands a drastic change in the way we have come to look at fellow earthlings. It is also about self liberation. To be freed from the violence that is connected to food is an incredibly freeing way to live. And then I believe, as an extension of the freedom that comes a vegan lifestyle, the food on our plates should tell a tale of liberation as well. Since going vegan, my diet has become far more eclectic and creative than it ever had been. I have learned about all kinds of amazing and versatile foods that grow from the earth and I can say with complete honesty that I never feel limitation with my food choices. I choose the whole spectrum. Sure I like salad as much as the next vegan, but some days all I want is a Daiya frozen pizza or a Buffalo Bomber from Veggie Grill and including that into my diet (and any vegan diet) is an important part of my food philosophy. I write about this now, while sharing this recipe, because I had to think about this recently. Jason and I used to be once-a-week pizza eaters. It was our go-to meal and I’m pretty sure we’ve made a pizza for every single one of our friends. But ever since my 30 day cleanse I’ve had avoided all things bread. Very slowly after the cleanse I starting adding things back into my diet – coffee, sugar, soy – but for some reason the taste for gluten/grain/wheat was not there. Then last week I figured it out. I had been connecting guilt to my eating habits. After feeling so good from my cleanse, I was resisting (without success) all those foods which I had identified as “bad” foods. Every day I would wake up and commit to a whole foods/grain free day and every day around lunch time I would “screw up”. And for some reason bread was my ultimate barrier between “good” eating and “bad” eating. Without knowing it, I had begun developing my own unhealthy eating habits, restricting myself from certain foods, and totally changing the food philosophy I had lived by for 8 years. So what did I do about it? I made pizza, of course! Not any pizza, either. 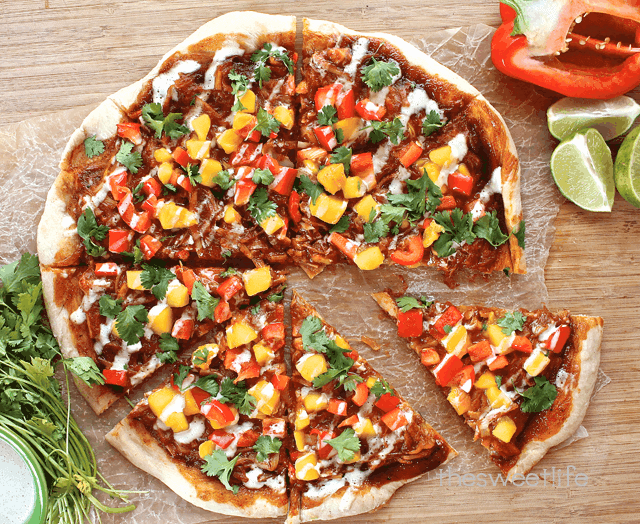 Vegan Pulled Pork Pizza. I’m sure I will have to unravel these feelings that developed post-cleanse a bit more, but until there is the space for that I will fight back that desire to restrict with opening up my plate to all the foods I love once again, hopefully with the moderation I sought when I begun the cleanse. The vegan pulled pork was inspired by this AMAZING creating by Fork & Beans. To make the BBQ "Pulled Pork", with your fingers shred the hearts of palm, making the pieces as thin as possible. Place in small bowl and mix in 1/2 cup BBQ sauce. Let marinade for at least 1 hour. When ready, heat the oil over medium heat in a cast iron skillet. Add onions sauté until caramelized - 10 - 12 minutes. Add onions to the shredded heart of palm and set aside. To make the Mango Salsa, combine the ingredients in a small bowl. Transfer to the refrigerate for at least 30 minutes. To make the Cilantro Cashew Cream, drain and rinse the cashews. Place them in a high-speed blender or food processor with the remaining ingredients and process until completely smooth. Transfer to an airtight container and refrigerate until ready to use. Preheat the oven to 425F. If you are using a raw pizza crust, bake for 8-10 minutes first. Remove from oven and spread the remaining 1/4 cup BBQ sauce evenly across the crust. Top with BBQ "pulled pork" and mango salsa and return to oven for another 5 minutes, until crust is golden brown. Remove from oven, drizzle with cashew cream and fresh cilantro leaves. BBQ chicken pizza was always one of my favorites! I love the idea of using hearts of palm as shredded chicken! This pizza looks amazing and I can’t wait to give it a try! Went to check out this recipe and saw an ad for organic meats!? Do you not have the ability to specify what ads are shown? It was not a good first impression. Thank you. I am trying to work all this out with my publishing network, so i appreciate the heads up. Do you have a pizza crust recipe? I don’t have one. I always buy pre-made dough at my local grocery store that just needs it’s second rise and baking. My best recommendation for homemade pizza dough would be http://www.veganricha.com. She has a variety of pizza crust. I think that’s what I was looking for. As a non-vegan who eats mostly plant-based meals I’m very sympathetic with vegans and have great respect for the commitment and creativity the lifestyle requires. I’m always curious about other people’s choices about food and diets and the ethics and justifications behind those choices. I’m also interested in the potential vegan and vegetarian eating has to reshape and influence the American diet, regardless of whether or not people give up animal products altogether, or just reduce their consumption. I’m totally unfamiliar with heart of palm, but this seems like a great idea for a pizza! As far as I can tell mango salsa is good with everything. As usual, thank you for the inspiration. On the other topic of your post, I’ve been reading and thinking lots lately about food, the food system, vegetarianism and veganism, sustainability, local food, healthy living, the microbiome, etc. etc. (!) and one thing that has stuck out in my mind regarding veganism is how to deal with the problem of unwanted bugs and animals on farms and in gardens. On a regular basis I go in the garden and dump the earwigs in my lettuce into water, lure slugs to an intoxicated death in homemade beer traps, and squish the many cabbage moth caterpillars I find making a mess of our wonderful kale. I also occasionally (actually this happens often) get very angry at the squirrels destroying the pears in our pear tree, launching whatever projectile is near me up in the tree (it doesn’t help). I can only imagine that something similar takes place on our CSA and not to mention what farmers resort to with larger problem animals like rabbits, deer, gophers, etc. After that lengthy rambling paragraph, I guess my question is what would a vegan response be to these problems? At some point is it necessary to accept some death with food production, or can it be entirely avoided? Hey Jon, thanks for the comment. I can only speak to my thoughts on this which although I don’t know assume would be agreed commonly by vegans. I believe in the food chain and don’t take a stance on whether or not humans were meant to be herbivores or omnivores. What matters to me is not only the abuse but also our attitude that because we are smarter or more physically able we can use them however we choose. For that reason I abstain from all animal products because it’s a system I don’t want to have anything to do with. However, and this is where I might disagree with mist vegans, among people groups that hunt, kill, skin, cook whatever their own animals I am okay with. That is where I believe the food chain is at work. Of course people don’t need animals to survive but I’m not going to argue someone who disagrees and wants to participate in the food chain by physically taking part in it (hunting, killing, etc). So I suppose this relates to your question in that animals must die for others to live. And they do for our vegetables. My parents actually run a CSA and I understand this happens and must happen. And just as farmers will kill small bugs or animals they will continue to eat the crop and that’s just how it goes. Veganism for me is saying no to animal cruelty. Saying no to viewing animals as ours for the taking be that entertainment, clothing, food, experiment. So I guess I see no overlapping problem with what you’re talking about. Great question! Thanks for the discussion. I was writing this on my phone while nursing the baby to sleep so I hope it makes some sense! Let me know if anything I said needs clarification. Looks yummy – but look for ethically sourced heart of palm as they usually have to kill the whole tree just to harvest it. We have ethically sourced options here in Australia, not sure about USA.. I made this recipe last evening. It was excellent. I was a little nervous about all the different flavours, but they all went well together and it was a very nice change from my same old pesto, spinach walnut pizza. I would make this again ! Even my non-vegan family members enjoyed it….. Excellent! I’m so glad you liked it! is the 1/2 cup of water supposed to be added to the blender mix as well? I am trying this recipe tonight! it looks great. Yes, it’s different than the water the cashews are soaking in. Couple of things that stood out for me in your thoughtful post – – it’s amazing how often I’ve read (from vegans) that their diet became so much more interesting and diversified after going vegan, and the same was very true for me. Non-vegans just don’t get that at all. AND – that goofy tendency some of us (all of us??) have to assign “good” and “bad” to various foods. I always feel slightly guilty about eating bread, too, but I adore it in all of its various incarnations. So I’m going to continue to enjoy it! Very well said Sarah – I too am vegan for the animals and as it happens it is the right thing for the body too. It is a pity that these “influential” people are moving back to an animal based diet – I suspect it may be simply because of a poor diet and perhaps their lifestyles don’t make it easy for them to eat well. Poor health has nothing to do with the exclusion of meat from your diet (although it is their decision of course) however, if you eat well most days and take the trouble to prepare yourself a meal, the odd junk food is perfectly acceptable and does no harm. I love pizzas and Field Roast sausages when I can find them (hard to locate in London) and a bag of crisps etc etc… who doesn’t. For me, veganism has never meant eating like an ascetic, just eating differently and concocting dishes with the humblest of vegetables or legumes – it’s fun, exciting and you never know what masterpiece you may end up with. Thanks Sarah – that pizza looks just so good, will definitely have a go. what a nice post on your veganism. i completely agree with you that i have a far more eclectic diet than i ever did when i was an omnivore, even a vegetarian. and this pizza is so perfect for summer. i love mango so much.